FTC disclosure: I received a free copy of this DVD to give an honest review of this movie. This Is Our Time is a Christian movie about five recent college graduates. Two head off to India to work with lepers, one joins a prestigious finanical institution, another gets a great job in social media, and the fifth feels left behind as the rest of this close knit group of friends are pursing their dreams -- and he's left making sandwiches in a coffee shop since he didn't get into grad school. I enjoyed the movie, however, I found it a little preachy at times. I prefer Christian movies where the message is subtle, but I know that doesn't bother everyone. This would make a fantastic movie for a church outreach as it does discuss things like God's will for our lives, God's plans, and death as one of the main characters dies in the movie. Of course, the others deal with grief the best way they can. As in real life they blame themselves, "If only I was with her" and "If only I hadn't called". As suddenly as life ends for one character, there's changes for three others. Life isn't easy and this movie doesn't sugar coat things and even highlights the fact that just because we are Christians doesn't mean we are immune to pain and tragedy. 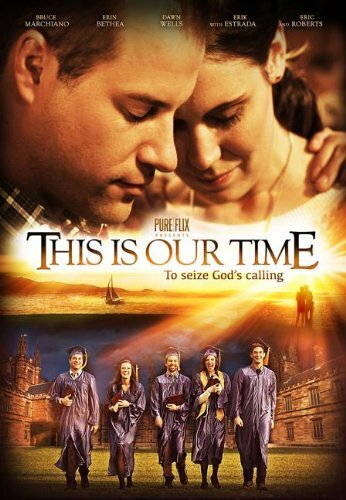 This would also be a good movie to show to a college aged church group as the focus is the future, what the future holds, and how God's plan for us might not be what we had in mind. I think back to my final night at our campus ministry. The seniors stood before the rest of the group and there was prayer, our campus ministry leader said he hoped in ten or twenty years he'd get great reports about what we were doing for God. We had some do some seemingly great things from that group. One is working with a ministry serving the poorest of the poor in Africa. There's a fair share of stay at home moms raising children in a Christian environment. But also, we have had our fare share of things not going as planned. One followed his planned career path for a year, then went back to school for a different degree. A girl had nearly died her junior year so we experienced knowing that we were not immortal even before our diplomas were in hand. Of course, at least one of those twenty is divorced. Life isn't easy and doesn't always go as planned, and this movie highlights that. I enjoyed this movie and I think others will as well. only made it through one half year of college, and I was going to be a teacher. Typical story- fell in love, got preggers and dropped out. Never went back. I should have, but that was years ago. No regrets! I've only completed a year of college. I had to stop going because of other things going on in my life and now I'm expecting a daughter in the next week or so, so it may be hard to go back anytime soon, but I'm only 22 and I still have plenty of time to go back and finish. Austin, Congratulations on your daughter! :) Yes, plenty of time to finish! I'm sure she'll be a great joy to you! I wanted to travel and use my degree. Done and still doing it! I didn't go to college. I started a business right out of high school. I'm loving my life as I'm living my dream right now of being a wife and mother. It did not! I could not find a job ended up getting pregnant and raising my kid/ kids. i thought i would work as a teacher for a little and then get married and homeschool my kids but I there are not teaching jobs in this area and I haven't found a husband. but i have 2 great nieces and i was able to help my mom raise my sister since i didn't have a busy crazy teaching life!